Roofs are expected to last a long time, for decades in fact. However, no roof is warranted to last forever. A time comes when you have to replace your roof with a new one. Roof installation does not come cheap. Homeowners are therefore advised to estimate the cost and prepare their budget before undertaking any project. Expect every roof estimate to vary because material prices differ as well as labor costs. The location of your house and roof type also make a difference. A rough estimate of installing new shingles roof would vary from $2.75 to $7.50 per square foot. That would translate to about $275 for a basic bid to $750 for a high-end and full warranty work per square. A square equals 100 square feet. Contractors could charge around $4 to $7 per square foot or $400 to $700 per square range for asphalt shingles replacement services. Locations, as we stated above, affect prices with cities in the North East being significantly higher than those in the Deep South. A general rule in construction is assigning a 60% to 40% labor to material cost breakdown. This is not set in stone but a mere guideline in computing costs. 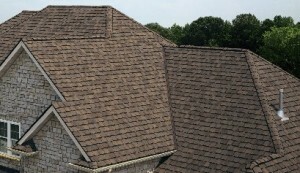 A basic 3-tab 25-year shingle costs from $150 to $200 per square, which includes the necessary materials. These may include underlayment, ice and water shield, nails and ridge-vent. The material cost may also include trash bags, plywood, planks and dumpster. Installation estimates assume the house is single story with a roof surface of 15 to 20 meters and a hip and gable roof. Labor cost is around $400 to $500 per square with the total amounting to a range of $6,725 to $9,000 under a 5-year warranty on labor. Architectural shingles cost more to install than the basic 3-tab shingles. Expect to pay around $75 to $100 more per square. The added cost is justified by contractors as a premium on higher installation quality for the more durable and longer-lasting shingles. For a single-story house with hip and gable combination roof, the cost could add up to $7,850 to $11,000. The amount varies depending on the contractor, quality of installation, size and complexity of the roof, location of the house and other factors. Premium shingles such as the 50-year architectural shingles cost more than the other roof shingles. Installation cost will run somewhere around $600 to $700 per square or a total of $9,000 to $14,000 for the entire roof. As stated above, the cost will vary depending on the variables, including the company that you contracted with. A longer labor warranty is a component of the increased installation cost.